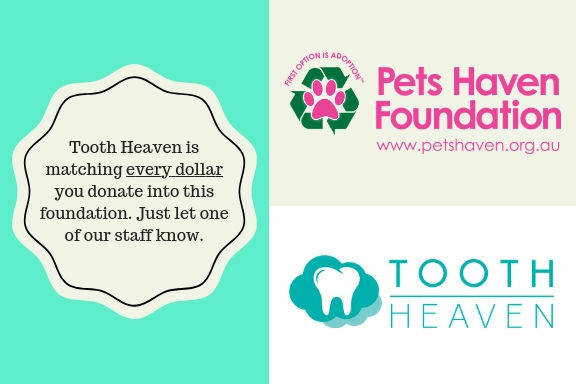 Tooth Heaven has decided to partner with Pet Haven to help lonely puppies and kittens live a better life and hopefully one day find a loving home. Again, congratulations to the 2016 Winner, Kaitlin Every for her winning entry for the competition held earlier this year. Join us on Facebook as we keep you up-to-date with Kaitlin's journey here at Tooth Heaven. We're going to be posting the questions she asked and the journey she goes through as her teeth ( and life ) changes every single hour, every single day of her life. Everyone really couldn't wait to see how the final results would look like! Is your child nervous about a visit to the dentist ? The Child Benefits Dental Scheme ( CDBS ) was introduced on the 1st of January 2014 to provide basic dental services to all children aged between 2-17 years. The total benefit is capped at $1000 a year and is means tested for every family. The CDBS provides benefits for examinations, x-rays, cleaning, fissure sealing, fillings, root canals and extractions. As of March 2016, The PM Malcolm Turnbull has considered scrapping the CDBS from the coming financial year onwards. “Labor initiated the scheme following alarming reports by the Australian Institute of Health and Welfare that 42 per cent of five year olds and 61 per cent of nine year olds had experienced decay in their baby (deciduous) teeth and 58 per cent of 14 year olds had experienced permanent tooth decay,” she said in a statement. Now might be the best time to use the CDBS $1000 benefit before it never sees the day of light again. Book an appointment with Tooth Heaven to make full use of your voucher. Many thanks to Yvonne and her team to allow our team to come out for an info day with the kids of St Brendan's Kindergarden. This well equipped and organized Kinder allowed us to teach the kids on ways to brush, reasons of why brushing is important and also learning on how to distinguish between good and bad foods. We sincerely hope the kids have learnt a thing a two from us, just as much as we had so much fun with the people at St Brendan's Kindergarden. During our recent competition running on facebook about the giveaway of a set of Free Braces, there were multiple entries for the competition. Thank you to everyone who have took their time to participate in our competition. Most were creative, intuitive, funny and inventive whilst there were some that were really heart-wrenching. We wish we could give out free braces to everyone who participated, however the World doesn't world like that. There can only be one winner! And the winner is.........Jamie Lee Roche! Congratulations! Stay tuned for more updates and how Jamie went with the whole experience with us!